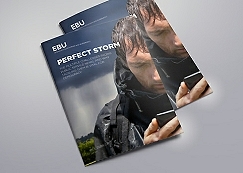 EBU launches quality journalism initiative called Perfect Storm. Geneva, July 2017: [Source: EBU] The provision of high-quality, independent news is at the very heart of public service media’s remit. However, today’s newsrooms are facing a myriad of challenges and how they tackle them will be key to the survival of public service media (PSM) and, arguably, the very future of democracy itself. To support Members through this period of transition, the EBU is launching a new Quality Journalism initiative to help newsrooms re-define and re-position their offer to audiences. The Quality Journalism initiative was launched at the EBU’s General Assembly with the publication of a new report ‘Perfect Storm’. The report addresses the challenges facing public service news providers and explores how Members throughout Europe are adapting to changing demands. The pressure on broadcasters is coming from many directions: from political and economic threats to changing consumption patterns and the need to do more with less to reach all audiences. All at a time when ‘fake news’ is undermining trust in media and threatening the stability of democratic societies. EBU Director of Media Jean Philip De Tender said: “The EBU has been supporting Members to deliver high-quality news and journalism since its inception. However, Members are now facing a period of unprecedented change and we want to see what new services we can offer to meet new demands. “We have already set up an incredibly popular User Generated Content Verification Network which provides Members with up to 40 cleared videos every day and recently we launched a network of editors-in-chief to address wider issues in the field of journalism. ‘Perfect Storm’ shows how broadcasters large and small are having to come up with increasingly radical solutions to adapt to change and modernise their output. Throughout Europe, public service news providers are repositioning themselves and developing techniques to face up to the challenges of a financially stringent multi-platform age. With TV audiences getting older, it is essential PSM develop a presence on multiple new platforms. But freeing up resources to create teams to serve those platforms involves difficult choices. For example, DR in Denmark cancelled the entire breakfast programme on their main TV channel to focus resources elsewhere. While Channel 4, in the UK, has chosen to concentrate its limited resources on Facebook, using original material to grow its Facebook views from 80 million in 2014 to 2 billion last year. The digital era also presents broadcasters with massive human resources challenges. YLE in Finland has taken the most radical approach to this, sending all its new hires to work on the youth brand Kioski for two to three years before they are let loose in the main newsroom. This way all new staff will naturally fit with their mobile first policy. And newsrooms have to think about the physical set-up of their space with flexible, open plan areas and a central intake or digital desk with everything radiating from there. Cross-team collaboration to ensure resources are used efficiently on multiple platforms is essential for today’s operations.